Prime Minister Edouard Philippe told senators yesterday that the government will deploy "exceptional" security measures for the protests in Paris and elsewhere, with additional new forces on top of the 65,000 security officers already in place. Some "yellow vest" protesters, members of France's leading unions and prominent politicians across the political spectrum called for calm after the worst rioting in Paris in decades last weekend. Museums, theatres and shops in Paris announced they would close tomorrow as a precaution - including the city's famed Eiffel Tower. President Emmanuel Macron on Wednesday agreed to abandon the fuel tax hike, part of his plans to combat global warming, but protesters' demands have now expanded to other issues hurting French workers, retirees and students. 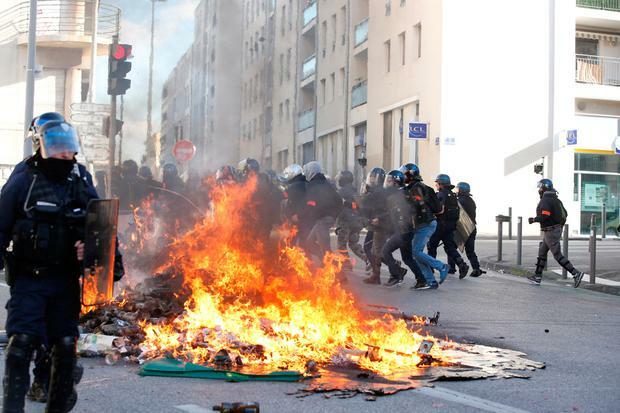 Scores of protesting teenagers clashed with police at a high school west of Paris yesterday, according to French news reports, as part of nationwide student protests over new university admissions procedures and rising fees. French police have come under criticism for failing to prevent damage to the Arc de Triomphe and stores along the famed Champs-Élysées in Paris last weekend - as well as for violence against protesters. Videos on social media of police beating protesters at a Burger King near the Champs-Élysées have stoked the anger.